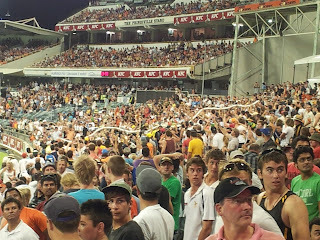 The legless lizard that only appears at the WACA ground a few times a year made another appearance at the final of the 2020 KFC Big Bash last week. Thankfully, Mick was on hand to capture the monster and send it in to us. Onya Mick. Reptilian experts are in the process of proving the identity of the massive snake, considered one of the longest ever seen at the WACA. Tragically, the serpent was exterminated by ruthless security guards who now face an independent inquiry by the RSPCA and potential criminal proceedings.